Our 2019 Airsoft “Walk-on” Events take place every Sunday, and alternate between our two fantastic venues at Portishead and Cribbs Causeway, Bristol. 10th FEBRUARY – OUR VALENTINE’S GAME. 21st APRIL – OUR EASTER GAME. 26th & 27th MAY – OUR WEEKENDER GAME. BOOK ONLINE NOW! 16th JUNE – OUR FATHER’S DAY GAME. 25th AUGUST – OUR EVENING GAME. 27th OCTOBER – OUR HALLOWEEN GAME. 10th NOVEMBER – OUR BONFIRE EVENING GAME. 22nd DECEMBER – OUR CHRISTMAS EVENT GAME. Pre-book price: £20 entry. Turn up on the day price: £25 entry. We do not take bookings “via Facebook” as sometimes these do get missed. £25 – for complete gun set-up including eye and face protection, and all in one overalls. This needs to be pre-booked and paid by the Friday prior to the game day before 12:00 pm. To apply must have attended Black Ops 3 times in no less than 2 months, and no more than a year apart. Forms can be requested from our Facebook or venue official. PROOF OF ADDRESS: i.e. a recent bank statement, or bill ( less than a month old ) must show the name and address which matches your Passport or Driving licence. Our 2017 Airsoft “Walk-on” Events take place every Sunday, and alternate between our two fantastic venues at Portishead and Bristol. All you need to do is phone us by the Friday prior to the game day before 12:00pm. Turn up on the day price: £22 entry. 27th/28th (Sunday/Monday) August – at Cribbs Causeway, Bristol WASTELANDS WEEKENDER EVENT! 22rd October – at Cribbs Causeway, Bristol ZOMBIE EVENT! 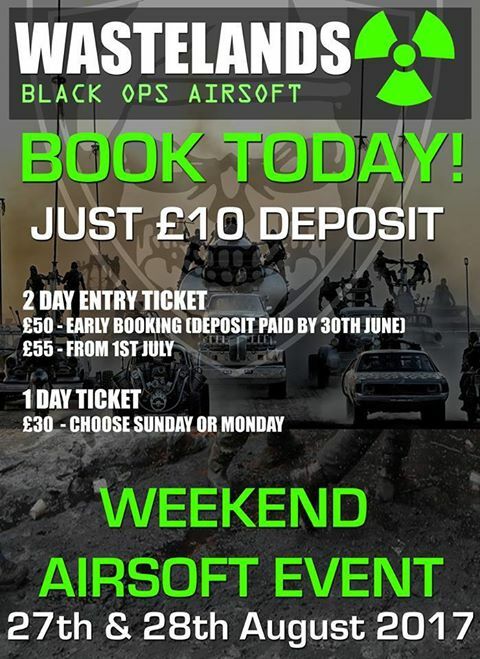 FANTASTIC AIRSOFT ‘WEEKEND’ EVENT! – 28th and 29th of August, 2016. £45 – For the whole weekend including the Saturday night camp. £25 – ONE DAY ONLY – Either the Sunday or Monday. Starts from 5pm on Saturday 27th. It includes TWO evening games. BBQ Cookout and FREE camping and toilet facilities. Games take place between 10:00am – 4:30pm. Road block building with decommissioned rocket launcher and tonnes of REAL props. FREE TANK RIDES – during the lunch break. FREE axe throwing between 5:00pm and 7:00pm. Refreshments and BBQ Campfire Cookout. FREE camping and toilet facilities. PYRO! Including, “Kick through doors” and “Bomb diffusing” and more!